Though not in the same class as the earlier Carol Reed-Graham Greene collaborations The Fallen Idol (1948) and The Third Man (1949), Our Man in Havana (1959) still occupies the second-tier of above average spy films. A black comedy mainly concerned with the disconnect between the cloak-and-dagger seriousness of Britain's MI6 and its less-dedicated, more self-serving field agents, it draws on Greene's own years with the Secret Service during the war, when Greene was based in Spain and Portugal and encountered much blithe corruption similar to that found in his 1958 novel and subsequent film adaptation. Seen today, Our Man in Havana's main point of interest is that while set at the tail end of the Batista regime and amidst civil war, it was filmed on location there just as that government was collapsing and the revolutionaries were taking over. Fidel Castro, initially supportive of the project, even visited the set during filming. Thus, in glorious black-and-white CinemaScope, Our Man in Havana captures a defining moment in world politics much like The Third Man captured early postwar Vienna. But where The Third Man was darkly funny and grimly suspenseful at the same time, Our Man in Havana is frustratingly schizophrenic and almost episodic, playing like an Ealing comedy at times - it reminded me of the Ealing-esque Alec Guinness comedy The Captain's Paradise - at other times it's darker and deadlier like The Third Man. Guinness's placid, largely unchanging title character is a bit like his later George Smiley without the spectacles, yet feels inapt. Columbia Pictures financed the chiefly British production. The Hollywood company was enjoying an unprecedented success with David Lean's The Bridge on the River Kwai (1957) and around this time began pouring money into British-made films of all kinds, from big productions like this to smaller, whimsical Peter Sellers vehicles and Hammer horror, thriller and swashbuckler films. No doubt Columbia's influence resulted in the film's unusual mixture of British and American talent, though the supporting cast is mostly very good. James Wormold (Guinness) is an expatriate Brit and imported vacuum cleaner salesman living in Havana, single parent to barely adult daughter Milly (Jo Morrow) since his wife left him. 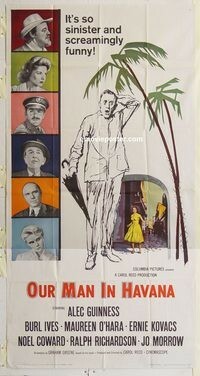 Hawthorne (Noël Coward) of MI6 attempts to recruit him as their Havana operative but Wormold, while amused by the offer, is reluctant to accept it until he realizes that the extra income will allow Milly to buy the horse she's long dreamed of. At the suggestion of longtime German friend Dr. Hasselbacher (Burl Ives), Wormold invents a team of agents, using the real identities of movers and shakers at the local country club, and pockets their salaries and "expenses." "C" (Ralph Richardson), head of MI6 back in London, presses Wormold for results, so he sends them sketches of a secret missile base in the snow-capped (!) mountains of Cuba, using vacuum cleaner parts as a model. Impressed by his supposed intelligence gathering, they send him a staff including secretary Beatrice (Maureen O'Hara) as his lucrative ruse begins to unravel. Further complicating matters is Batista strongman and torturer Captain Segura (Ernie Kovacs), who pressures Wormold's blessing so that the Cuban can marry Milly. But at the same time the movie pulls back, even awkwardly trying to avoid the fact (possibly via postproduction tinkering by the studio) that Wormold is compelled to shoot one man in cold blood. Even Graham Greene later admitted that while sending up British Intelligence he depicted the Batistas as too genial and less brutal than they really were. Another obvious Hollywood concession was to cast Columbia ingénue Jo Morrow (The 3 Worlds of Gulliver) as Guinness's daughter, American accent and all. She's okay but never believable. That said, the casting of comedian Ernie Kovacs as Segura was inspired; it's probably the best of his handful of movie performances. Folksy Burl Ives is another odd fit as a German World War I veteran, but he's acceptable, though the part seems to cry out for someone like Gert Frobe or Paul Lukas. The real problem is Guinness. Superlative actor though he was, his entire approach seems wrong. Savant praises his one good quality as a spy, his calm demeanor under pressure, but in the rest of the film he's almost irritatingly enigmatic. Guinness was red-hot at the time thanks to Kwai, but throughout Our Man in Havana I kept thinking how much better an actor like Peter Sellers or John Mills would have been. The character is written as mild-mannered if desperate to indulge his materialistic daughter, but Guinness plays him circumspect and nearly as unreadable as his celebrated agent George Smiley. Mills might have brought out Wolmold's naivetés and meekness better, while Sellers could have been terrific suppressing Wormold's quiet panic as he gets closer and closer to being discovered. Ultimately, it's the all-access given to Reed and cinematographer Oswald Morris to Castro's vibrant, exciting Cuba at its very beginning is what really makes Our Man in Havana fascinating viewing today. Black-and-white CinemaScope was the perfect format for Our Man in Havana, and the excellent encoding provided to Twilight Time by Sony shows off the location work to exceptionally good advantage. The 1.0 DTS-HD Master Audio is also very good, and optional English subtitles are provided on this region-free disc. Supplements are limited to an isolated music & effects track, a trailer, and booklet essay by Julie Kirgo. Imperfect but fascinating, Our Man in Havana is Highly Recommended.